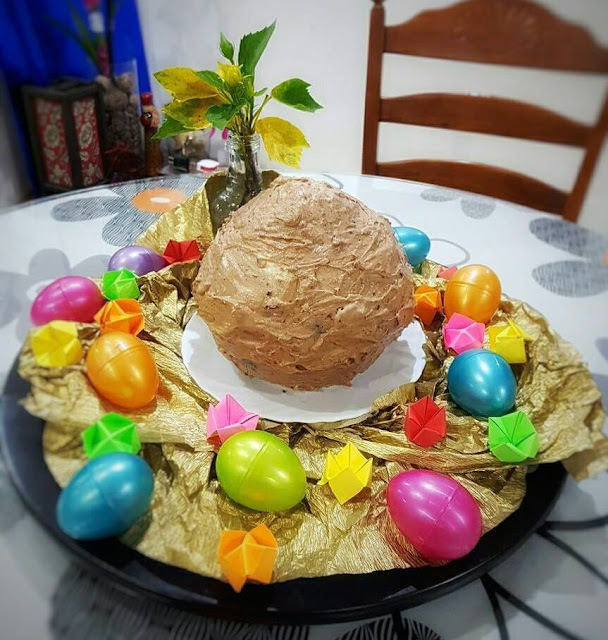 This cake was originally made for Easter as a giant chocolate ball cake. Posting this a little late because..time. Here's a quick video and the ingredients below. This cake came pretty easy with the help of Magnolia Devil's Food Cake Mix and 3 big packs of Double Stuffed Oreos. Follow instructions on Magnolia Devil's Food Cake Mix. Add in crushed Oreo cookies without the cream, and 2/1/2 cups milk. Mix all of the ingredients in a bowl using mixer. Brush container in pressure cooker with butter or vegetable oil before putting the mix in. Press “Cake” on your pressure cooker and wait for the magic. Once done, cool cake down to warm temperature. You may also use your oven, if a pressure cooker is not available. Crush cake and mold shape into two separate bowls. Your cake must look like bowls with space in the center. Put the bowls with cake molds in the refrigerator for at least 1 hour. Bowl #1: Add in 200g softened butter and use mixer until airy/creamy. Add 1 cup confectionery sugar (or as wanted), 1 tbsp. vanilla, and 1-2 melted Cadbury Dairy Milk with Oreo and mix until preferred texture is achieved. Set aside. Bowl #2: Add in 250 ml cream and use mixer until thick/airy. Add in 1 cup confectionery sugar (or as wanted), 1 tbsp. vanilla, 3 packs Double Stuffed Oreos (use cream only) and mix. Add in 1-2 tbsp. unflavored liquid jello until thick creamy texture is achieved. Take the 2 bowls of cake molds out of refrigerator and pour in Icing - Bowl #2 to the center of each molds equally. Put back the 2 cake molds with cream inside the refrigerator and wait 1 hour. As seen in the video (1:12), place the plate on top of the mold and turn cake upside down to remove the bowl. Make sure the cream has solidified in the center. Do the same for both molds and place one of the cakes on top of the other to form a ball. Once done, spread Icing - Bowl #1 on the outer layer of the cake, and seal the middle part. Place back in the refrigerator for 30 minutes and you're done!